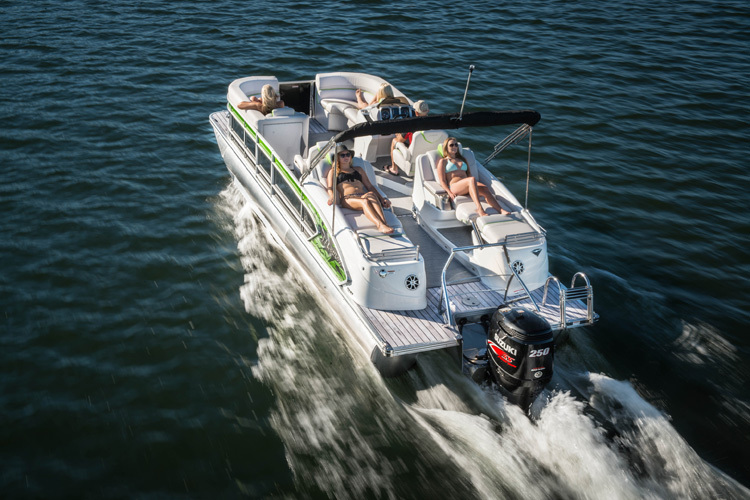 Once upon a time pontoon boats were mere party platforms, but today, you can get performance that will knock your socks off. Historically pontoon boats were floating boxes with comfy seats and a dinky little egg-beater of a powerplant, and a fast pontoon boat was one that could break 20 MPH. These days, pontoons offer everything from built-in wet-bars to wakeboarding towers to underwater lights, and they can go fast. 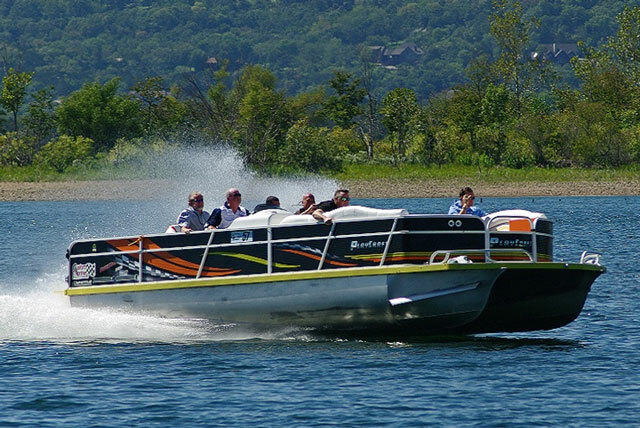 Really fast (check out the Performance Pontoon Boats Video: The Need for Speed). If you want to bake the lake with speed and power, it’s no problem—as long as you have one of these five rocket-fast pontoon boats, all of which are available on the open market in some sort of "stock" form. 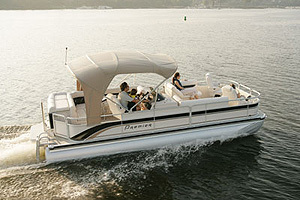 The Premier 290 is available in several incarnations, including both single and twin engine models. 1. 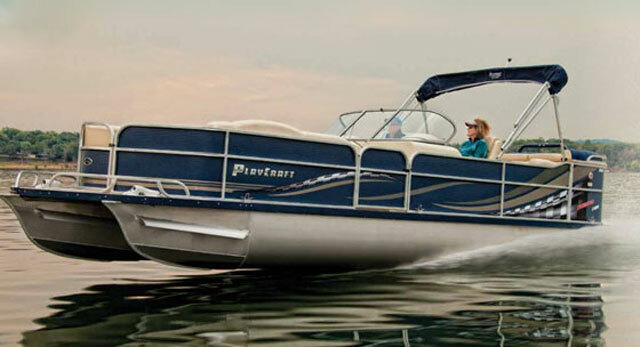 The Premier 290 – Let’s start out relatively mellow, with a fairly fast pontoon boat that carries up to 600 horses on a 29’ long tri-toon platform and reaches a top-end of 52.8 MPH. 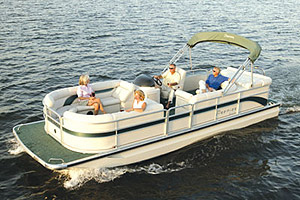 Yes, we just called a 50-plus MPH pontoon boat “mellow”. Because truth be told, that’s not extremely fast in today’s pontoon boat world. The 290 is, however, a rare specimen among ‘toons. It has a whopping 10’2” beam, and just about every comfort-giving feature known to man—including a bar, a refrigerator, an ear-splitting stereo, and an elevated helm station. 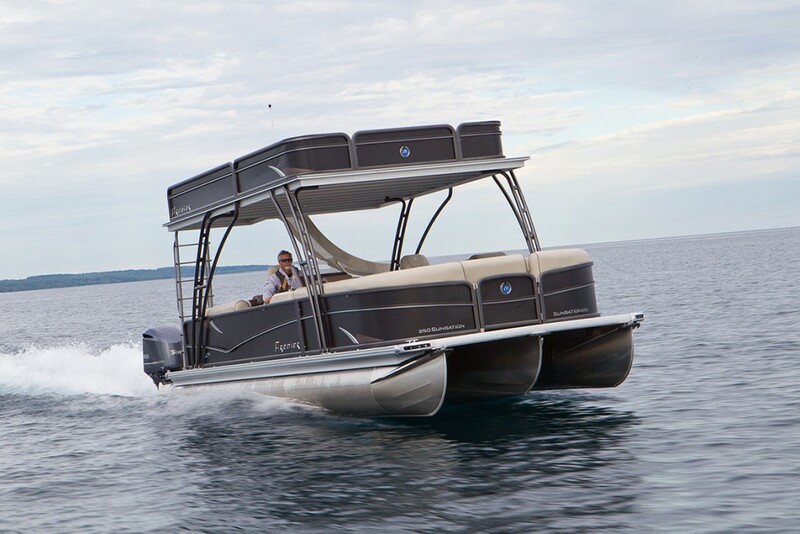 This pontoon is so impressive it even made out list of the Top 10 Pontoon Boats of 2013. Oh, and did we mention that it breaks 50 MPH? 2. Manitou X-Plode – Available in 23’, 25’, and 27’ models, the entire X-Plode line hits top-end speeds in the low to mid 50’s. This is a bit startling when you compare these pontoons to others carrying equal horsepower, because most will only run up to the mid 40’s. What gives? Manitou uses a unique design that includes a larger center tube mounted over an inch lower than the smaller side tubes, creating a differential of over five inches. They also have added lifting strakes, on both sides of all three tubes. You want a faster pontoon boat? You've got it - PlayCraft is one of the kings of speed, when it comes to 'toons. 3. The PlayCraft PowerToon Xtreme - So maybe you think cruising across the lake in the 50’s is tame (it’s not) and that breaking 60 MPH is a lot more fun (it is). 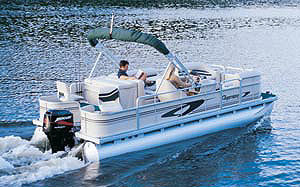 Step on over the the PlayCraft PowerToon Xtreme 2700, which can break the 60 MPH barrier in its stock form, with a 430 HP MerCruiser 496 MAG HO stern drive. The Xtreme series includes performance-enhancing touches like surface-piercing nose cones and handling fins. If you’re willing to go off the reservation, you can get a heck of a lot more speed out of one of these pontoon boats, too. In at least one documented case (at the 2011 Lake of the Ozarks Shootout) a 2700 broke an eye-watering 104 MPH, after being juiced up with a 540 cid Dart block and twin Whipple superchargers. The rig put out 1,350 HP—yikes! But otherwise the PlayCraft was a “stock” boat, proving that the platform is more than capable of high speed antics, right out of the box. A little monkeying, a little wrenching, and you, too, could be hitting 90 MPH. 4. 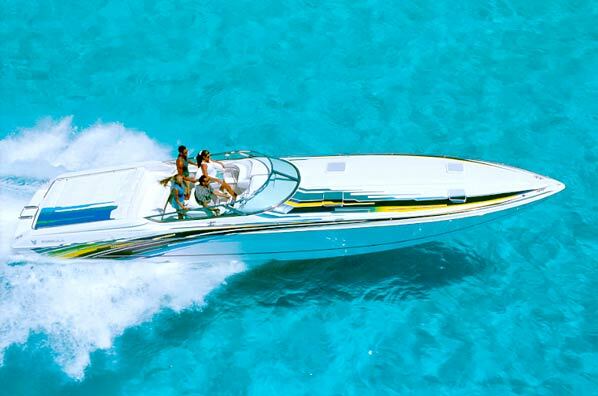 South Bay’s Super Sport 925 – Although stock models with a standard single powerplant tend to run in the upper 40’s (yawn) South Bay has rigged up boats with twin 300 HP outboards and hit speeds upwards of 90 MPH. A triple-engine rig carrying 900 Mercury horses (as well as some structural enhancements) even hit 112 MPH, at the 2012 Lake of the Ozarks Shootout. 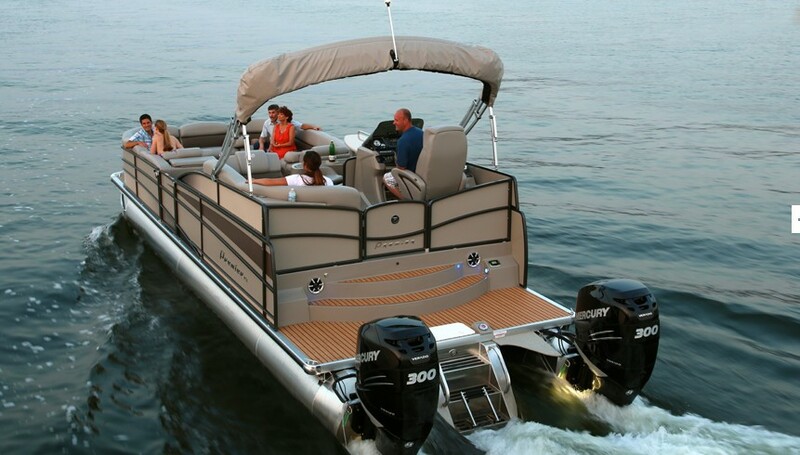 Beyond simply piling on more horsepower, credit goes to extensive attention paid to what lies below deck level, a section of the boat that often plays second fiddle to loungers and carpet choice in the world of pontoons. They incorporate a “performance skin” underneath the boat, which is formed to manage both water and air flow below deck level. Lifting strakes are added to the pontoons, as are unusually long nose cones. South Bay also claims these tweaks enhance handling and allow for a tighter turning radius, a claim which seems to be verified by South Bay’s winning of the 2010 PDB Barrel Racing Championship. PlayCraft strikes again, with the Scorpion version of its pontoon boat. 5. PlayCraft Scorpion Xtreme 2800– Yes, PlayCraft clearly has a fixation on being the fastest ‘toons in town. 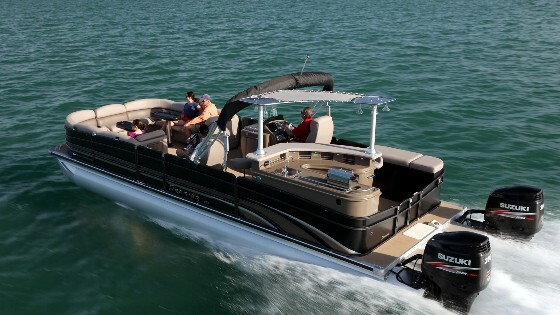 Along with the”regular” Xtremes, they decided to create a Scorpion version with twin 400-hp 383 Scorpion powerplants. The boat runs at up to 70 MPH, jumps on plane in under three seconds, and hits 30 MPH in under six seconds, but it utilizes a slightly different hull—if you want to call pontoons hulls—than the norm. Most high-speed pontoons run on triple logs (hence the name tri-toon) but in this case, a pair of logs was designed to trap air in-between the pontoons and utilize it to create lift. In both theory and practice, it works much like a modern powercat. The design also saves weight and reduces wetted surface. But weight is about the only thing PlayCraft shaves off of this boat; it still carries a full complement of poofy lounges, has gobs of stowage, and color-coordinated fabrics and vinyls. Oh, yes, and plenty of hand-holds. 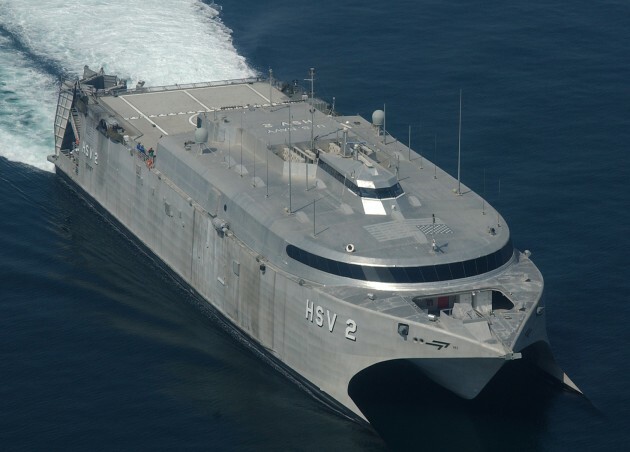 Bonus Toon: The Incat 98 Meter – This one isn't exactly available on the open market so we didn't want it to bump any of the other boats here, but just because it's over 320’ long, weighs in at over 600 tons, and carries a crew of 350 doesn't mean you can’t call it a pontoon. In fact, it’s made of aluminum and it runs on twin wave-piercing hulls—what more do you want? Although its top speed is classified, the Incat claims an “average” speed of around 40 MPH and top end is rumored to go well beyond 50. If you see one of these cruising across the lake, we recommend giving way.